This is the right place for Top 100 AWS Interview questions and answers for freshers or experienced. Amazon web services interview questions are in objective type framed by our AWS training experts, This helps you to crack the interview successfully and improve your AWS technical skills. Now a day everything is rotating around cloud platforms, Amazon web services are the most trending cloud platform nowadays with market share 33% ahead of all cloud service platforms. 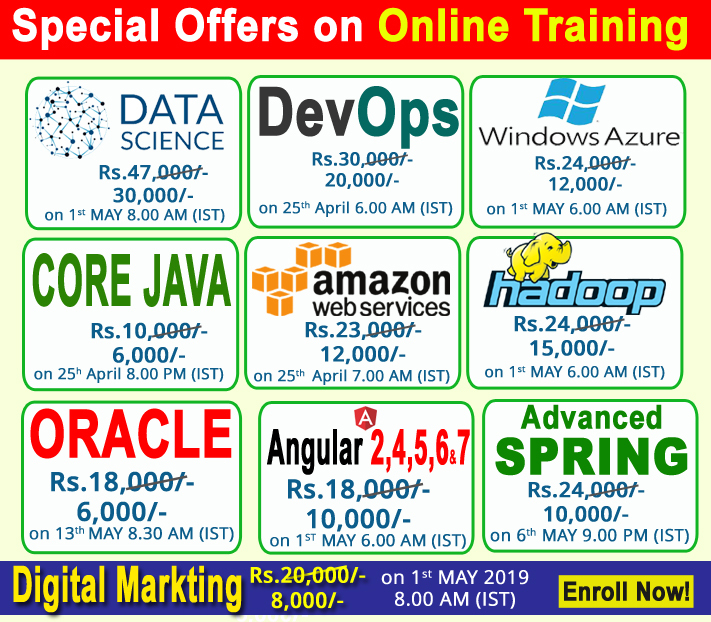 We offer AWS online course and AWS classroom training by expert trainers to give you practical software industry exposure to meet present IT Demands. Q1. You currently have an EC2 instance hosting a web application. The number of users is expected to increase in the coming months and hence you need to add more elasticity to your setup. Which of the following methods can help add elasticity to your existing setup. Choose 2 answers from the options given below? Setup an Elastic Cache in front of the EC2 instance. Setup your web app on more EC2 instances and use Route53 to route requests accordingly. Q2. You are creating a Provisioned IOPS volume in AWS. The size of the volume is 8 GiB. Which of the following are the possible values that can put for the IOPS of the volume? Q3. A company is hosting EC2 instances which focuses on work-loads are on non-production and non-priority batch loads. Also these processes can be interrupted at any time. What is the best pricing model which can be used for EC2 instances in this case? Q4. You have 2 Ubuntu instances located in different subnets in the same VPC. Now to your understanding these instances should be able to communicate with each other, but when you try to ping from one instance to another, you get a timeout. The Route tables seem to be valid and has the entry for the Target ‘local’ for your VPC CIDR. Which of the following could be a valid reason for this ? The Instances are of the wrong AMI , hence you are not able to ping the instances. The Security Group has not been modified for allow the required traffic. Q5. What is the best way to move an EBS volume currently attached to an EC2 instance from one availability zone to another ? Detach the volume and attach to an EC2 instance in another AZ. Create a new volume in the other AZ and specify the current volume as the source. Create a new volume in the AZ and do a disk copy of contents from one volume to another. Q6. When it comes to API credentials, what is the best practice recommended by AWS? Create a role which has the necessary and can be assumed by the EC2 instance. Use the API credentials from an EC2 instance. Use the API credentials from a bastion host. Use the API credentials from a NAT Instance. Q7. You want to retrieve the Public IP addresses assigned to a running instance via the instance metadata. Which of the below URLs is valid for retrieving this data. Q8. You are planning to use the MySQL RDS in AWS. You have a requirement to ensure that you are available to recover from a database crash. Which of the below is not a recommended practice when you want to fulfill this requirement? Ensure that file sizes for the RDS is well under 6 TB. Q9. Which of the following is a valid bucket name?. Q10. Which of the following is not a feature provided by Route53? Q12. Which of the following verbs are supported with the API Gateway? Q13. Which of the following container technologies are currently supported by the AWS ECS service? Q14. Which of the following when used alongside with the AWS Secure Token service can be used to provide a single sign-on experience for existing users who are part of an organization using on-premise applications? Q15. While performing status checks on your volume in AWS , you can see that the volume check has a status of “insufficient-data”. What can you derive from this status check? The check on the volume is still in progress. Q16. Which of the following can constitute the term of a “Golden Image”? This is the basic AMI which is available in AWS. This refers to an instance which has been bootstrapped. This refers to an AMI that has been constructed from a customized Image. This refers to a special type of Linux AMI. Q17. When designing a health check for your web application which is hosted behind an elastic load balancer, which of the following health checks is ideal to implement? Q18. Which of the following is an example of synchronous replication which occurs in the AWS service? Q19. You want to get the reason for your EC2 Instance termination from the CLI. Which of the below commands is ideal in getting the reason? Q20. When using the following AWS services, which should be implemented in multiple Availability Zones for high availability solutions? Q21. An application is currently configured on an EC2 instance to process messages in SQS. The queue has been created with the default settings. The application is configured to just read the messages once a week. It has been noticed that not all the messages are being picked by the application. What could be the issue? Q22. Your application is on an EC2 instance in AWS. Users use the application to upload a file to S3. The message first goes to an SQS queue, before it is picked up by a worker process, which fetches the object and uploads it to S3. An email is then sent on successful completion of the upload. You notice though that you are getting numerous emails for each request, when ideally you should be getting only one final email notification for each successful upload. Which of the below could be the possible reasons for this? The application is configured for long polling so the messages are being picked up multiple times. The application is not deleting the messages from SQS. The application is not reading the message properly from the SQS queue. Q23. You have created your own VPC and subnet in AWS. You have launched an instance in that subnet. You have noticed that the instance is not receiving a DNS name. Which of the below options could be a valid reason for this issue? The VPC configuration needs to be changed. The subnet configuration needs to be changed. Q24. You have created your own VPC and subnet in AWS. You have launched an instance in that subnet. You have attached an internet gateway to the VPC and seen that the instance has a public IP. The Route table is shown below? The instance still cannot be reached from the Internet. Which of the below changes need to be made to the route table to ensure that the issue can be resolved? Q25. You wanted to have a VPC created in AWS which will host an application. The application will just consist of web and database servers. The application just requires to be accessed from the internet by internet users. Which of the following VPC configuration wizards options would you use? Q26. Which of the following statements are true with regards to EBS Volumes. Choose 3 correct answers from the options given below? EBS Volumes can be attached to any EC2 Instance in any AZ. After you attach a volume, it appears as a native block device similar to a hard drive or other physical device. Q27. You are a solutions architect working for a large oil and gas company. Your company runs their production environment on AWS and has a custom VPC. The VPC contains 3 subnets, 1 of which is public and the other 2 are private. Inside the public subnet is a fleet of EC2 instances which are the result of an autoscaling group. All EC2 instances are in the same security group. Your company has created a new custom application which connects to mobile devices using a custom port. This application has been rolled out to production and you need to open this port globally to the internet. What steps should you take to do this, and how quickly will the change occur? Open the port on the existing network Access Control List. Your EC2 instances will be able to communicate on this port after a reboot. Open the port on the existing network Access Control List. Your EC2 instances will be able to communicate over this port immediately. Open the port on the existing security group. Your EC2 instances will be able to communicate over this port immediately. Open the port on the existing security group. Your EC2 instances will be able to communicate over this port as soon as the relevant Time To Live (TTL) expires. Q28. You are creating a number of EBS Volumes for your EC2 instances. You are concerned on the backups of the EBS Volumes. Which of the below is a way to backup the EBS Volumes? Q29. You have a set of IIS Servers running on EC2 Instances. You want to collect and process the log files generated from the IIS Servers. Which of the below services is ideal to run in this scenario? Q30. You are trying to configure Cross Region Replication for your S3 bucket. But you are not able to select the option of Cross Region Replication and is disabled. Which of the below could be the possible reasons for this? Q31. What is the amount of temp space is allocated to you when using Lambda functions per invocation? Q32. You have a requirement to create a subnet in an AWS VPC which will host around 20 hosts. This subnet will be used to host web servers. Which of the below could be the possible CIDR block allocated for the subnet? Q33. You run a website which hosts videos and you have two types of members, premium fee paying members and free members. All videos uploaded by both your premium members and free members are processed by a fleet of EC2 instances which will poll SQS as videos are uploaded. However you need to ensure that your premium fee paying members videos have a higher priority than your free members. How do you design SQS? SQS allows you to set priorities on individual items within the queue, so simply set the fee paying members at a higher priority than your free members. Create two SQS queues, one for premium members and one for free members. Program your EC2 fleet to poll the premium queue first and if empty, to then poll your free members SQS queue. SQS would not be suitable for this scenario. It would be much better to use SNS to encode the videos. Use SNS to notify when a premium member has uploaded a video and then process that video accordingly. Q34. Which of the following services natively encrypts data at rest within an AWS region? ( Choose two )? Q35. Your EC2 instances are configured to run behind an Amazon VPC. You have assigned two web servers instances to an Elastic Load Balancer. However, the instances and the ELB are not reachable via URL to the elastic load balancer serving the web app data from the EC2 instances. What could be done to resolve this issue? Q36. You want to ensure that you keep a check on the Active Volumes, Active snapshots and Elastic IP addresses you use so that you don’t go beyond the service limit. Which of the below services can help in this regard? Q37. You are building an automated transcription service in which Amazon EC2 worker instances process an uploaded audio file and generate a text file. You must store both of these files in the same durable storage until the text file is retrieved. You do not know what the storage capacity requirements are. Which storage option is both cost-efficient and scalable? Q38. You are an AWS Administrator for your company. The company currently has a set of AWS resources hosted in a particular region. You have been requested by your supervisor to create a script which could create duplicate resources in another region incase of a disaster. Which of the below AWS services could help fulfil this requirement? Q39. What are bastion hosts? They are instances in the public subnet which are used as a jump server to resources within other subnets. They are instances in the private subnet which are used as a jump server to resources within other subnets. They are instances in the public subnet which are used to host web resources that can be accessed by users. They are instances in the private subnet which are used to host web resources that can be accessed by users. Q40. You have several AWS reserved instances in your account. They have been running for some time, but now need to be shutdown since they are no longer required. The data is still required for future purposes. Which of the below possible 2 steps can be taken? Create a duplicate EC2 Instance in another AZ. Keep it in the shutdown state. When required , bring it back up. Backup the EBS data volume. If the instance fails , bring up a new EC2 instance and attach the volume. Store the EC2 data on S3. If the instance fails , bring up a new EC2 instance and restore the data from S3. Q42. Amazon’s Redshift uses which block size for its columnar storage? Q43. You working in the media industry and you have created a web application where users will be able to upload photos they create to your website. This web application must be able to call the S3 API in order to be able to function. Where should you store your API credentials whilst maintaining the maximum level of security? Save the API credentials to your PHP files. Don’t save your API credentials. Instead create a role in IAM and assign this role to an EC2 instance when you first create it. Save your API credentials in a public GitHub repository. Pass API credentials to the instance using instance userdata. Q44. You are a systems administrator and you need to monitor the health of your production environment. You decide to do this using Cloud Watch, however you notice that you cannot see the health of every important metric in the default dash board. Which of the following metrics do you need to design a custom cloud watch metric for, when monitoring the health of your EC2 instances? Q46. You are IOT sensors to monitor the number of bags that are handled at an airport. The data gets sent back to a Kinesis stream with default settings. Every alternate day, the data from the stream is sent to S3 for processing. But you notice that S3 is not receiving all of the data that is being sent to the Kinesis stream. What could be the reason for this. The sensors probably stopped working on some days hence data is not sent to the stream. Q47. You are defined the following Network ACL for your subnet? What will be the outcome when a workstation of IP 20.202.20.252 tries to access your subnet? Q48. Which procedure for backing up relational database on EC2 that is using a set of RAIDed EBS volumes for storage minimizes the time during which the database cannot be written to and results in a consistent backup? Q49. You are a solutions architect working for a company. They store their data on S3, however recently an someone accidentally deleted some critical files in S3. You’ve been asked to prevent this from happening in the future. What options below can prevent this? Make sure you provide signed URL’s to all users. Enable S3 versioning and Multifactor Authentication (MFA) on the bucket. Use S3 Infrequently Accessed storage to store the data on. Create an IAM bucket policy that disables deletes. Q50. You run an automobile reselling company that has a popular online store on AWS. The application site behind an Auto Scaling group and required new instances of Auto scaling group to identify their puclic and private Ip addresses. How can you achieve this? Q51. You are the solution architect for a company. The company has a requirement to deploy an application which will need to have session management in place. Which of the following services can be used for session management accordingly? Q52. You are working for an Enterprise and have been asked to get a support plan in place from AWS. Which of the following would meet these requirements ensuring that cost is kept at a minimum? Q53. Which of the following is incorrect with regards to Private IP addresses? Q54. Which of the following are best practices for monitoring your EC2 Instances? Q55. For which of the following use cases are Simple Workflow Service (SWF) and Amazon EC2 an appropriate solution? Choose two answers from the options given below? Managing a multi-step and multi-decision checkout process of an e-commerce website. Orchestrating the execution of distributed and auditable business process. Q56. You work for a major news network in Europe. They have just released a new app which allows users to report on events as and when they happen using their mobile phone. Users are able to upload pictures from the app and then other users will be able to view these pics. Your organization expects this app to grow very quickly, essentially doubling it’s user base every month. The app uses S3 to store the media and you are expecting sudden and large increases in traffic to S3 when a major news event takes place as people will be uploading content in huge numbers). You need to keep your storage costs to a minimum however and it does not matter if some objects are lost. Which storage media should you use to keep costs as low as possible? S3 – Infrequently Accessed Storage. S3 – Reduced Redundancy Storage (RRS).